At +Australian Enviroblast, we provide a wide variety of wet abrasive blasting services, using the Quill Falcon Kwikblast Precision Dustless Blasting System. We operate throughout metropolitan Adelaide and regional South Australia, and our highly-skilled, experienced and professional teams have wide-ranging knowledge and expertise, meaning that we are able to tackle any type of wet abrasive blasting job, no mater the size or scale. At AEB, we have extensive experience in marine wet abrasive blasting, on all types of vessels, marine-based structures and equipment. Wet abrasive blasting is used on commercial fishing boats, passenger ships, ferries, yachts and other types of boats as a means of removing growths, old paint layers and contaminants prior to repainting and re-coating, and is often performed at the time of a ship's two-year survey. Prior to any re-coating, it is important that existing paint and industrial coatings are thoroughly and effectively removed, as otherwise any new coatings are likely to fail because they are unable to adhere to surface of the hull sufficiently well. Wet abrasive blasting means that surfaces are cleaned and profiled in such a way that industrial coatings and protective paints will last and serve to protect the vessel in the way they were designed to do. Wet abrasive blasting is a quick, effective and highly efficient way of removing line markings and other residues from the surfaces of roads, car parks and footpaths. Markings are successful removed from both the surface as well as cavities and depressions through abrasive material being blasted at high pressure, and this strips away unwanted markings or rubber residue without damaging or impacting on the road surface. The sorts of contaminants that can be quickly and successful removed from roads, car parks and footpaths using wet abrasive blasting include oil, grease, mould and rubber deposits, while non-slip surfaces can also be created through using this process. Road markings such as anti-skid surfacing, resin-based paints, permanent and temporary thermoplastic paint, surface dressing emulsion and temporary road marking tape are also effectively removed through wet abrasive blasting. Wet abrasive blasting is used extensively in the mining industry as a means of reducing the effects of corrosion and abrasion, and in so doing prolongs the operating life and performance of all types of mining equipment, structures and machinery. This is done through affected surfaces being stripped back to a corrosion-free base which in turn enables effective priming and the application of protective coatings. Our wet abrasive blasting services are also combined with the application of industrial coatings to mining equipment and machinery. We have experience in the wide variety of blasting and coating work that is required on mining sites, including machinery large and small, flare towers, storage tanks, pipelines, process tanks, earthmovers and other vehicles. 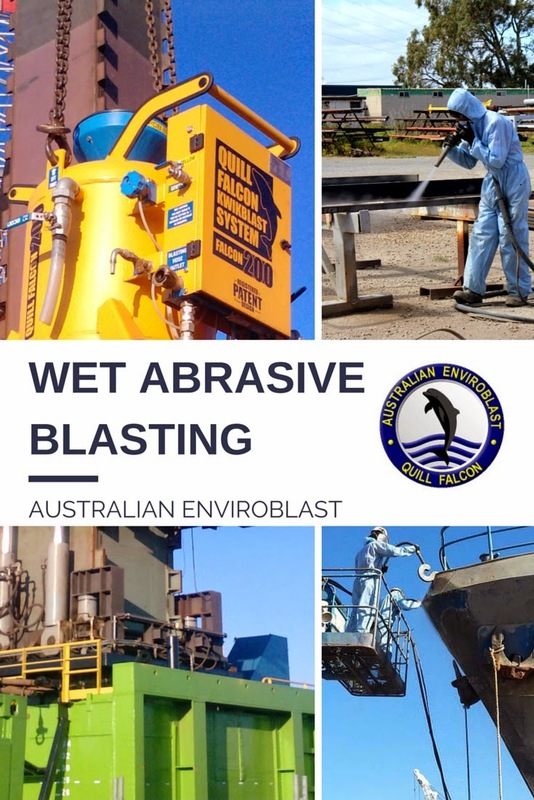 In order to find out more about these and the other wet abrasive blasting services that Australian Enviroblast is able to offer, please telephone +Mark Chiappin on +61 (0) 458 455 668 or email us admin@australianenviroblast.com.au.